Hello Friends! Happy Monday and welcome to this week’s One Stamp Three Ways post. 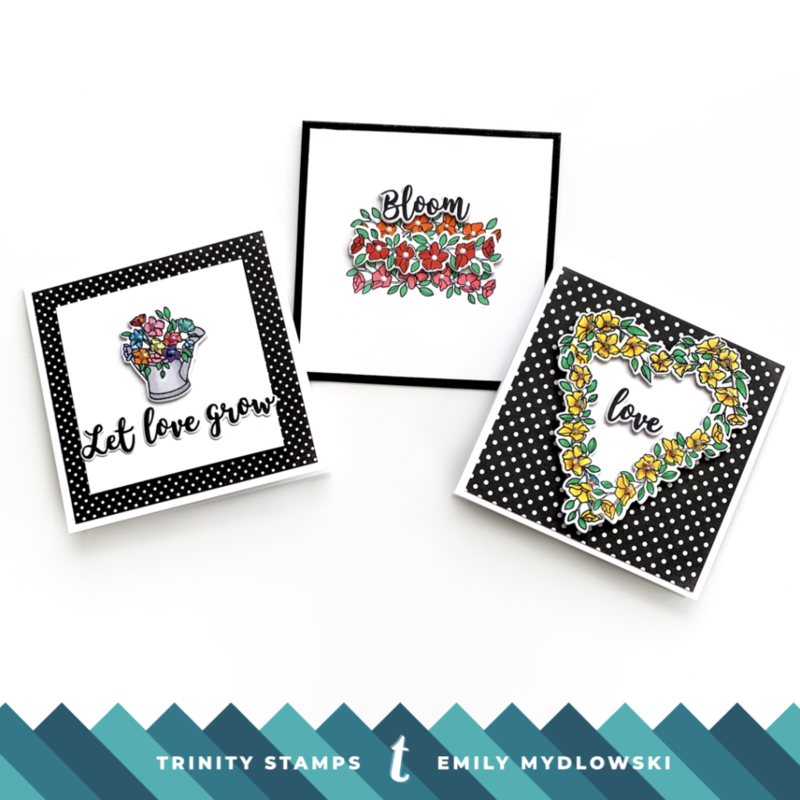 This week I’m sharing three 4×4 mini cards using the Hopeful Flowers 3×4 stamp set and matching dies. I must say I’m getting a little tired of all the cold winter weather and I’ve been wishing for Springtime. While I can’t change the seasons, I can bring Springtime to my craft room by making some bright and colorful floral cards. 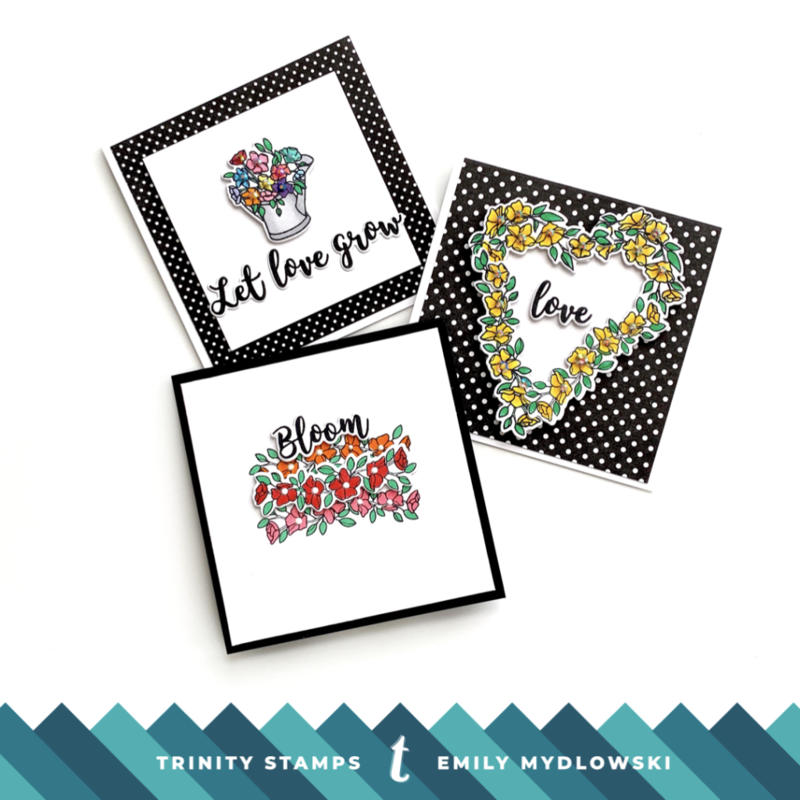 The Hopeful Flowers stamp set and matching dies are perfect for creating floral wreaths. For this card, I wanted to create a heart-shaped wreath full of bright and cheerful yellow flowers. Die cut a heart shape in white card stock. I used the Essentials by Ellen Folk Hearts dies. Stamp, color in yellow & green Copics and die cut several the floral images. Arrange and adhere the images around the heart die cut using Nuvo Delux Adhesive & foam dots. In some cases, I cut a few of the leaves so they didn’t stick out from the heart pattern. Add Crystalized Unicorn Tears Rhinestones to the flower centers. Stamp, die cut and adhere the love sentiment from Let Love Grow. Adhere polka dot patterned paper to the 4×4 card base and adhere the heart wreath with foam adhesive to the card base. This was a quick and simple CAS card that reminds me of a flower patch. I stamped two floral boughs to the center of a 3×3 card panel leaving just enough space to add a stamped and die cut floral bough to the center of the card panel. I did some quick one color Copic coloring in red, pink and orange and added Nuvo White Drops to the center of the all the flowers. Then I adhered the die cut floral bough to the center of the two floral boughs with foam adhesive. To finish the card, I stamped, die cut and adhered Bloom to the flower patch and adhered the card panel to a black card stock card base. Another clean and simple card using the sweetest watering can image from the set. 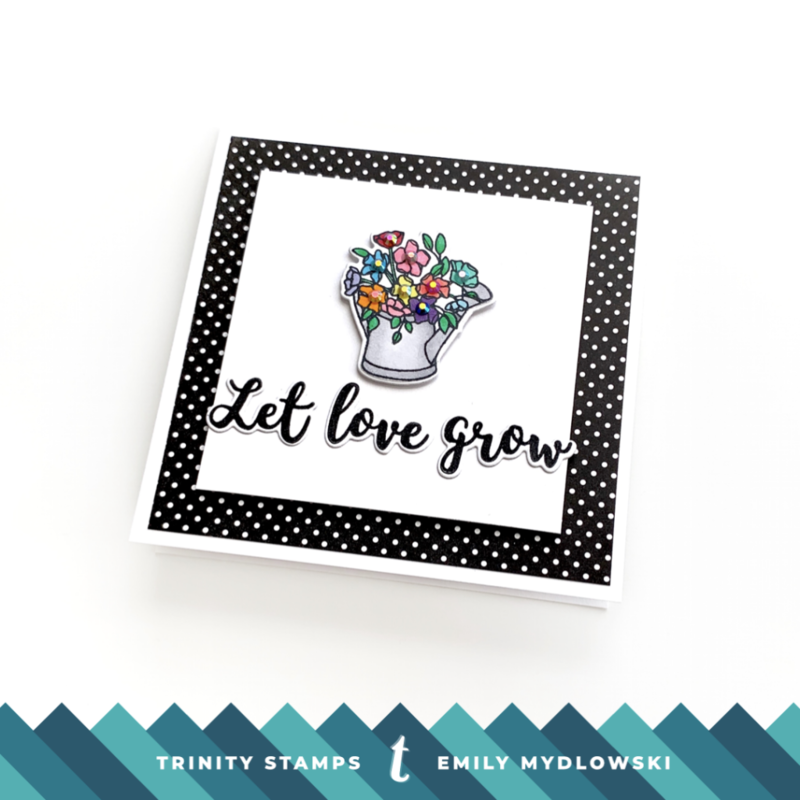 The rainbow flowers just warms my heart and the Let Love Grow sentiment is one of my favorites from the Let Love Grow stamp set. Stamp the watering can image with Copic safe ink and colored the images with several rainbow colors. Adhere the watering can with foam tape to a white card panel. I added Rainbow Connections Rhinestones in matching colors to the flower centers using Nuvo Deluxe Adhesive. Stamp and die cut Let Love Grow with VersaFine Clair Nocturne Ink (this ink is incredible for clean, crips sentiments) and adhere the sentiment words below the watering can. To finish the card, I adhered polka dot patterned paper to the card base and then adhered the watering can card panel with foam tape. So there we go friends, three cards with one small but versatile stamp set. I hope you enjoyed these projects and can’t wait to see you next week! 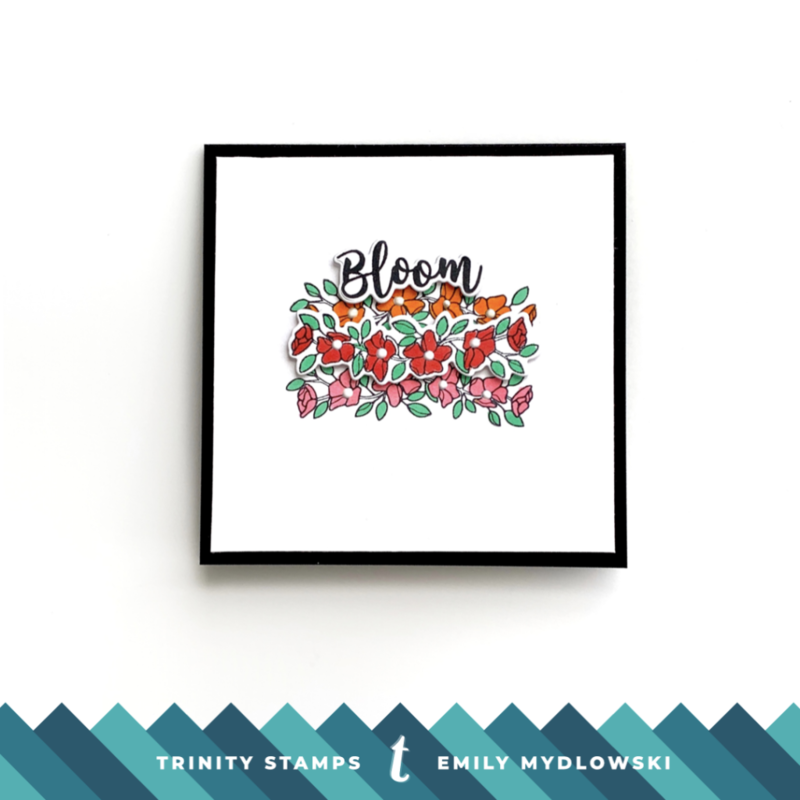 For more inspiration all week long, check out/subscribe/follow the Trinity Stamps Blog, You Tube Channel and Instagram. 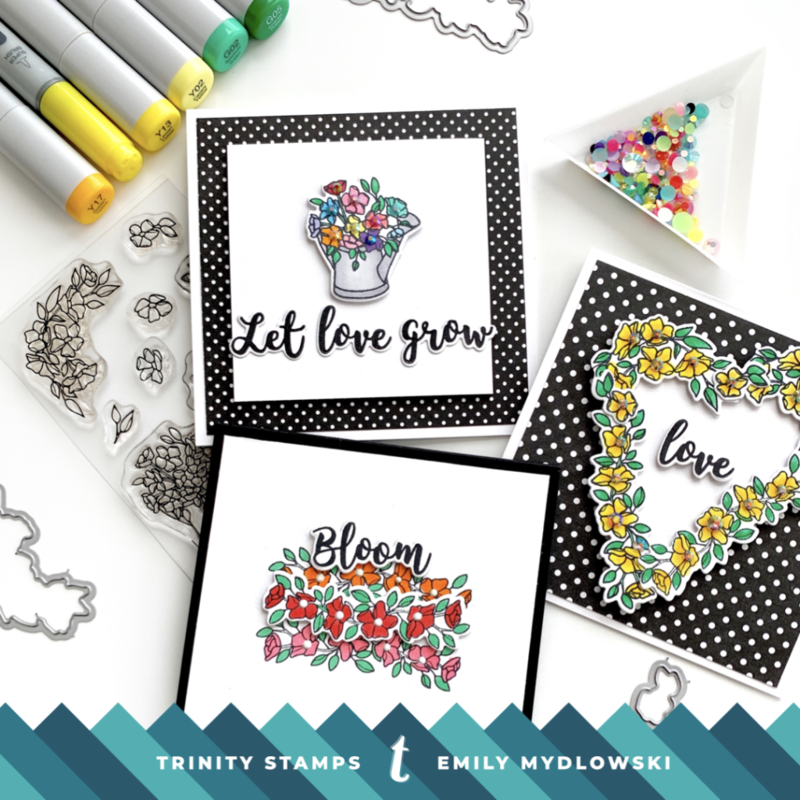 We love to see what you create with Trinity Stamps so don’t forget to post your Trinity Stamps creations on Instagram and tag #trinitystamps!